This pulls out the really long term, "pie in the sky" elements from the previous entry. -- "Crystal City Arlington as Amazon one-half of HQ2 | Part 1: General + Housing impact"
-- "Part 2: Leveraging Amazon's entrance for complementary economic development improvements"
-- "Crystal City Arlington as Amazon one-half of HQ2 | Part 3: Leveraging Amazon's entrance for complementary transit network improvements"
Washington/National Capital Region Map of Future (Potential) Rapid Transit Services. 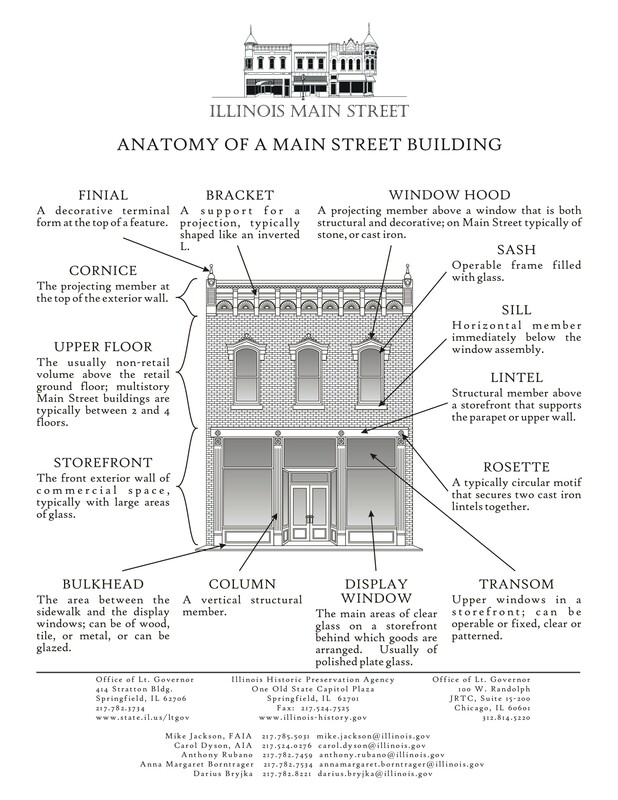 Designed by Paul J. Meissner, for the "Rebuilding Place in the Urban Space" blog. Last year's "Using the Silver Line as the priming event, what would a transit network improvement program look like for NoVA?" specifically lays out a framework for a transportation network improvement plan for Northern Virginia. These are super duper long term concepts, not currently on anyone's drawing board. Separating the Silver Line would add capacity and coverage in DC, provide an additional crossing between DC and Virginia, and would significantly improve capacity on the Blue/Orange lines, especially the highly used Orange line, and improve reliability by reducing the amount of "inter-lining" between lines. 1. Separate the Silver Line from the Orange Line by extending the line south to Rte. 50 and then east along Arlington Boulevard to Rosslyn. That would provide six new stations: West Street; Falls Church; Seven Corners; Arlington Forest; Ashton Heights; and Fort Myer. Continuing the Silver Line from its endpoint at Ashburn to Leesburg should be considered also, which isn't depicted on the above map. Separately the line would add a new connection into DC and pick up "the old" routing of the c. 2002 proposed "Separated Blue Line." This would significantly increase service reliability for the Blue, Orange, and Silver Lines, along with increasing capacity and redundancy and bringing high frequency rail to new areas..
2. 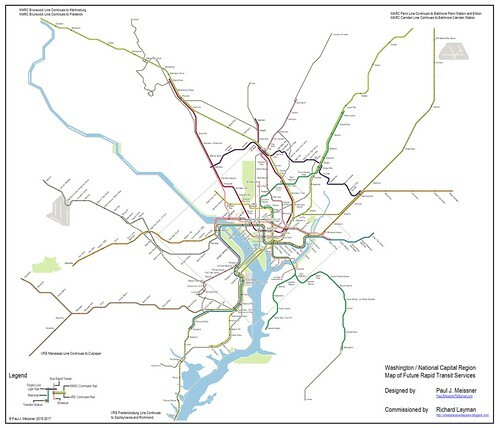 A new Pink Line rapid transit line (subway) is proposed serving Northern Virginia in the Columbia Pike corridor, with service to DC, adding eight stations in Northern Virginia: Lincolnia; Seminary Road; Skyline Center/NOVA Community College; Baileys Crossroads; Barcroft; Pike Town Center; Penrose Square; and Air Force Memorial. 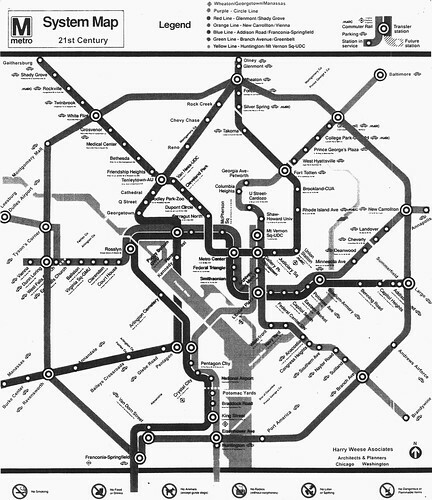 This c. 1990 WMATA proposed extensions map shows a line out Columbia Pike. Note the stations for Annandale and Baileys Crossroads. It proposed a terminus in Manassas. The Pink Line is Paul's concept, and includes some of my input concerning service beyond Silver Spring in Montgomery County. Note that original system planning for the Metrorail envisioned a line like this out Columbia Pike, but unlike our line which continues past the Silver Spring Metrorail station, the WMATA proposal terminated there. I would do this instead of a streetcar on Columbia Pike, and increase the allowed density over what was planned in association with a streetcar service. The RACER concept ("Railroad Authority for the Chesapeake Region") for merging MARC and VRE is discussed in "One big idea: Getting MARC and Metrorail to integrate fares, stations, and marketing systems, using London Overground as an example." With a couple exceptions, currently VRE trains are one way, going into DC in the morning and coming back to Virginia in the evening. Having one continuous line would reduce the need for equipment and train storage. 5. Incorporate the proposed VRE system improvements plan into this program. 6. 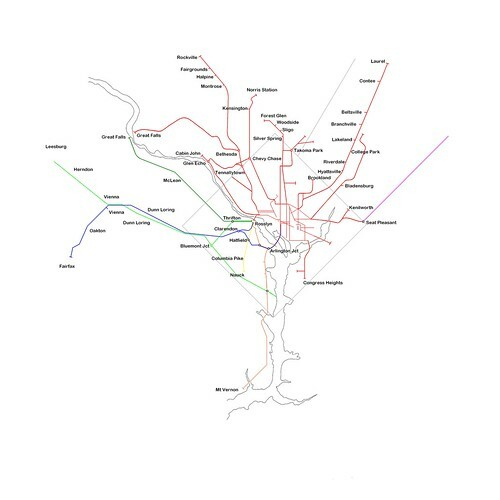 In keeping with the original concept of the Purple Line as a circular line linking the various heavy rail lines, extend the line into Virginia from Bethesda on the north, from New Carrollton to Alexandria on the south, and between Tysons and Alexandria on the west. The current program is to build the line from Bethesda to New Carrollton. No planning is underway to extend the line beyond that section, which is under construction with a tentative opening date set for 2022. 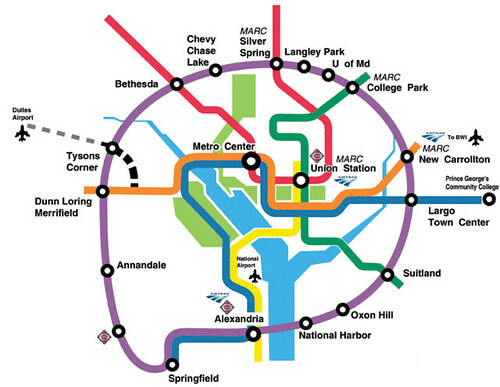 The original Purple Line concept connects the various heavy rail lines in Northern Virginia and Maryland, providing better east-west connections on the north and south sides of the transit network. Sierra Club Metro DC graphic. 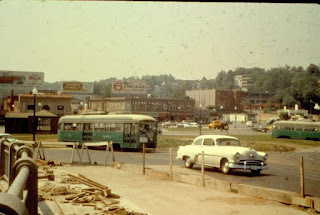 DC streetcar service used to have a turnaround loop in Rosslyn. Older streetcar service in Northern Virginia used to continue into DC, but when a new Key Bridge was constructed, access to Virginia-based streetcar lines was denied, and these various lines were discontinued. 7. I would add a heritage streetcar service for the National Mall including service to Arlington Cemetery and Rosslyn, as discussed here, "A National Mall-focused heritage (replica) streetcar service to serve visitors is way bigger idea than a parking garage under the Mall" and "New DC Circulator route serving National Mall reminds us that we are neglecting connections from west to east and fail to adequately connect Georgetown to the National Mall." This map from Wikimedia and produced by "SDC," shows all once extant electric streetcar and interurban lines serving the DC area, and shows that Rosslyn (and by extension Georgetown) was a major hub of services originating in Virginia. This story in the Boston Globe, "Boston is not prime for Amazon," makes that point that Boston has one of the highest priced housing markets, and is way behind in reinvesting in transportation, so that it was an also ran in the HQ2 sweepstakes.